The first time was a charm for the Crane boys basketball team this season, as the Pirates won the Class 2 state championship Mar. 19 in the school’s first-ever trip to the Final Four. The win also marked the school’s first state championship in any sport. It was a dream come true for the team, and especially for the Pirates’ four seniors. Senior standout Levi Cook led the way in the Pirates’ 77-63 victory over #4-ranked Bernie in the championship game with 42 points and 15 rebounds. 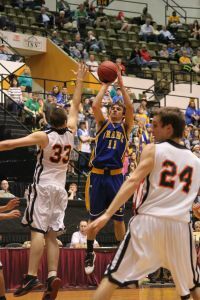 Cook nearly recorded the first triple double in state championship history, as he also dished out eight assists. “I just came out thinking that it was just another game, and all my shots seemed to be falling that night,” said Cook, who also broke Crane’s 51-year old career scoring record this season. Crane finished the season with a 27-5 record, but the way the season began did not exactly foreshadow the state championship to come, as the Pirates dropped three of their first five games. After a double overtime victory over Reeds Spring on Dec. 13, Crane reeled off five more victories, the last two coming in the Southwest Central League Tournament. The Pirates then lost back-to-back games to state-ranked Billings, the first in the SWCL championship game and the second a regular season contest six days later. The Pirates would not lose again, though, ending the season with 19 consecutive wins. In the first round of the District Tournament, Crane dispatched Galena, and then rolled over Ash Grove in the second round by a score of 72-33. State-ranked Billings, the Pirates’ SWCL nemesis, was upset in the first round by New Covenant Academy in a 100-99 thriller. 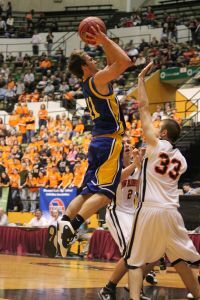 The Pirates defeated the Warriors 66-49 in the District title game. 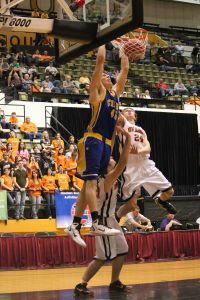 Crane’s Final Four dreams were nearly dashed in the Sectional round, as the Pirates needed overtime to defeat Miller 56-54. 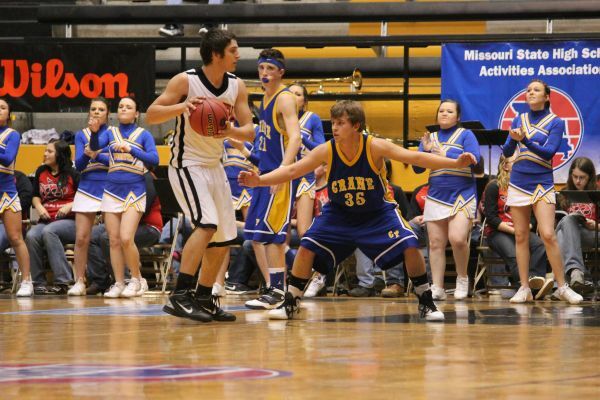 After a 69-51 victory over Linn in the state quarterfinals, Crane was bound for its first Final Four in Columbia. The Pirates defeated upstart New Bloomfield, which entered the game with a 13-16 record, by a 68-49 count to advance to the Class 2 state championship game, as Cook led the way with 22 points. The Pirates had the talents of an All-Stater in Cook, and the leadership of three other seniors, but this truly was a team effort. “We couldn’t have done it without our seniors or the rest of the team,” said Guerin. “They all played well and fulfilled their role well.” In addition to seniors Akins, Cook, Quick and Vermillion, the rest of the Crane Pirates included juniors Alex Estes and Cody Lumpkin, sophomores Jordan Bowling, Thomas Chabrecek, Bailey Moore, Cole Walden and Jonah Walker, and freshman Zane Mahan. The trip to the Final Four itself was a big deal around the Crane community, and winning the state championship was a nice bonus for the Pirate faithful who made the trek to Columbia. “It means a lot, because this is one of the most memorable things that will ever happen to the Crane community,” said Cook. “It means a lot to the community and I think they will always remember their first state championship,” said senior Anthony Vermillion. The Crane faithful were just as appreciative when the Pirates returned home with a state championship. “We are almost four hours away and had one of the biggest crowds that weekend,” said Guerin. “They showed their support by cheering loudly to keep the boys pumped up, and that helps our boys play that much harder. On Sunday (following the state championship game on Saturday), we made it back into town about 2:00 p.m., and they had signs decorating the road, along with a lot of people along the road and in the parking lot cheering, as we made our way back into town and unloaded into a mob of people. It was a great way of showing appreciation. “I would like to say thank you to my assistant coach, Joshua Loveland, my wife and bookkeeper, Gretta, and my student manager, Zach Cook, for all of their help,” added Guerin. “We couldn’t have done it without Coach Guerin, Coach Loveland, Gretta, or all of our fans and family,” said Cook, who will play collegiately next season at College of the Ozarks. Originally published in the April 2011 issue of Ozark Preps Illustrated.